Home › Home and Kitchen › Emeril 2 Piece Forged Cutlery Chef Set With Sharpener 3.5 Paring Knife 5 Sant..
Emeril 2 Piece Forged Cutlery Chef Set With Sharpener 3.5 Paring Knife 5 Sant..
Sharpen your culinary skills with Emeril's kitchen cuterly set! 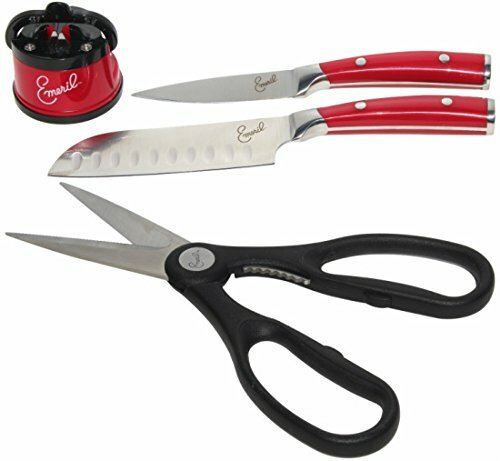 This kitchenknife set includes two knives with forged stainless steel blades that areuseful for everything from chopping carrots and tomatoes to slicing bread,plus a bonus pair of kitchen shears. The santoku and paring knives featurefull tang construction, with forged steel blades for effortless cutting, andergonomic handles for comfort. Once dulled by frequent use, the knives areborn anew with Emeril's countertop sharpener. A suction pad holds the devicefirmly against counters, as users carefully run blades past its revitalizingtungsten carbide edge.